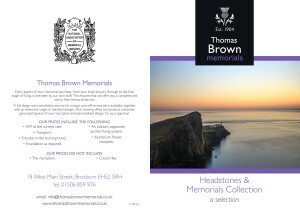 Our skilled and experienced in-house memorial masonry team, Thomas Brown Memorials, can create a lasting memorial for your loved one. We offer a wide range of styles and designs, all of which we can talk you through in detail if you’d find it helpful. There are many elements to a memorial – such as the type of stone and style of lettering used that can be selected, so that you can create a truly fitting memorial. We’re also able to arrange re-lettering, cleaning and new inscriptions for existing memorials. *Some cemeteries have certain restrictions relating to the size, material used and style of memorial they allow, we’ll advise you where this is the case and guide you through the types of memorial allowed for that site.